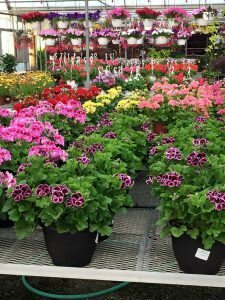 As the ground thaws and the frost goes away, come browse acres of greenhouses to pick out the flowers and vegetables that are just right for your gardening needs. Patch your lawn or start a new one. Pinter’s has a variety of grass seed for any size project. Pinter’s offers cut seasoned mixed hardwood firewood. Regardless of the time of year, Pinter’s carries bales of straw to fit all seasonal needs. We stock a large selection of potted plants that bloom in time for Easter. There are hundreds of flowering lilies, azaleas, tulips, daffodils, pansies and other bulb plants to choose from. Now that the hard work is done and your flowers and garden are planted. Be sure to visit Pinter’s Garden Center to keep your yard and garden looking great all summer. If you can’t wait to harvest your own garden-fresh produce, you don’t have to! Every summer, Pinter’s offers fresh fruits and veggies, mostly from our local farmers. 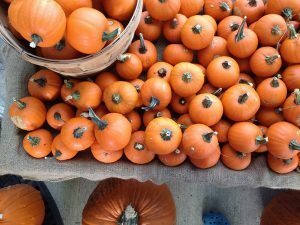 Be sure to decorate your home this fall with fall Mums, fall decorations and special Halloween items. Regardless of the time of year, Pinter’s carries bails of straw to fit all seasonal needs. Add some color around your house with Pinter’s home grown fall mums. With thousands to chose from, you are sure to find the right size and color for any location. The Holiday season is a special time at Pinter’s. Our greenhouses are filled with our home grown Poinsettias. Visit us for a complete selection of memorial blankets, wreaths, garland, and assorted holiday decorations. We grow more than 40,000 poinsettias in multiple varieties. No other place around sells the variety, quantity, and quality that we do. We will custom wrap and put a hand tied bow on the poinsettia of your choice. Sizes range from 4” to 10”. We have a great selection of fresh cut Christmas trees. Get yours today! Find the wreath that fits your needs. 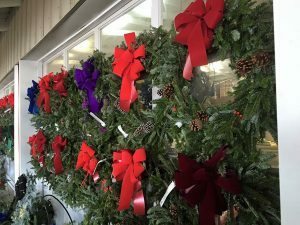 Pinter’s offers wreaths ranging in size from 12” to 48”. Chose from a pre-decorated wreath or order a custom decoration. Trim your house with fresh cedar or mixed roping. Available in 50’ strands. Remember your loved ones with a special memorial blanket. Chose from pre-decorated blankets or order a custom blanket.